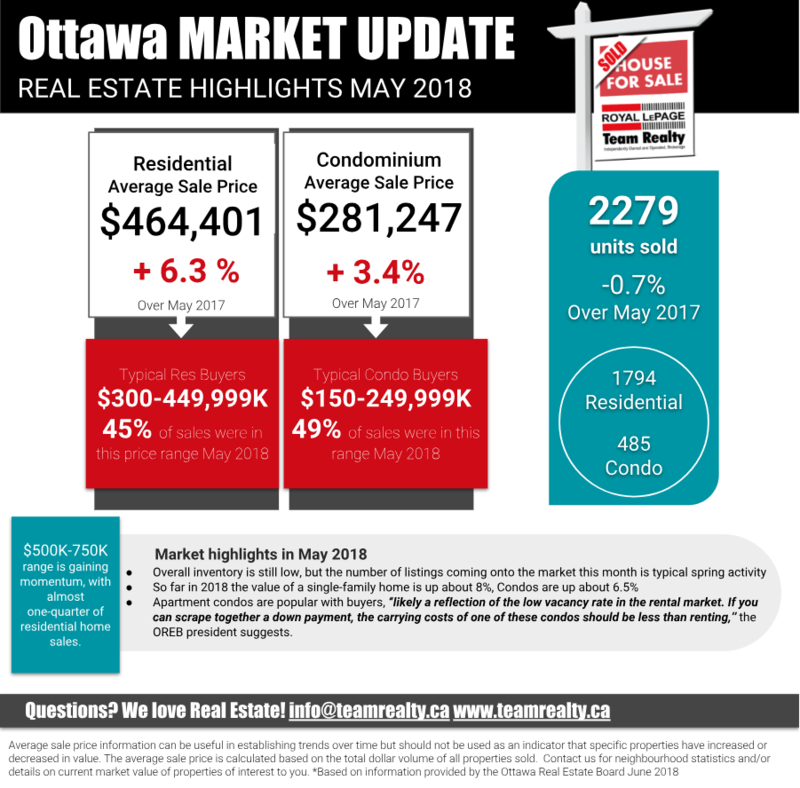 Ottawa Real Estate Market Snapshot: May 2018: While inventory is still lower than normal, the number of listings coming onto the market this month is typical spring activity! Have questions? Looking for specific neighbourhood stats? Message us!! Members of the Ottawa Real Estate Board sold 2,279 residential properties in May through the Board’s Multiple Listing Service® System, compared with 2,294 in May 2017, a decrease of 0.7 per cent. The five-year average for May sales is 2,041. May’s sales included 485 in the condominium property class and 1,794 in the residential property class. “Much of the total increase in property values have been experienced since the beginning of this year. Not only will this help new homebuilders validate their pricing since construction costs and development fees are so high, but it also will give baby boomers incentive to sell their homes which will help put inventory back onto the market,” he explains. “While our inventory stays at historically low levels, especially in some neighbourhoods, there will continue to be upward pressure on home prices. We definitely have the demand for housing in this city not only because it is still very affordable but because all the fundamentals are solid here. However, our city does need to have a longer-term housing supply strategy so that we aren’t confronted with future affordability challenges,” Shaw advises. The $300,000 to $449,999 range remains the most active price point in the residential market, accounting for 45 per cent of home sales, while the $500,000 to $750,000 range continues to gain momentum, now representing almost one-quarter of residential home sales. “Between $150,000 and $249,999 was May’s most active price point in the condominium market, accounting for 49 per cent of the units sold,” Shaw reports. “Moreover, apartment condos represent 52 per cent of the sales. This is likely a reflection of the low vacancy rate in the rental market. If you can scrape together a down payment, the carrying costs of one of these condos should be less than renting,” he suggests. In addition to residential and condominium sales, OREB Members assisted clients with renting 1,020 properties since the beginning of the year.